The reason the satellite gathered lower troposphere trends are rising over the last six years while the surface temperature trends are falling is due to the phenomenon I first identified around five years ago by examining the sea surface, land surface and lower troposphere datasets and comparison of the Outgoing Longwave Radiation (OLR)dataset, and the solar activity dataset tells us about the rate that energy is headed back into space compared to the rate it is coming in at. I’ll go through some background for new readers, so bear with me. One of the first things I discovered was that land surface temperatures mimic sea surface temperatures a few months later. The ocean is therefore the big dog in the Earth’s climate system not the atmosphere. It can contain as much heat in the top six feet as the entire atmosphere above it. The Sun heats the ocean because it’s rays penetrate 300 feet down into it. The ‘back radiation’ from greenhouse gases can’t directly heat the ocean because it is long wave radiation emanating from a cooler sky to a warmer sea. There is more upward radiation from the sea surface than downward from the sky. The net flux is up. Note: President Obama did not include the above graph under the Tweet. It has been placed there to show how our climate has NOT heated up in the past 15 years due to an increase in CO2. ...If CO2 is such a powerful greenhouse gas and the major driver of global temperature as alleged, why does it stop rising? According to AGW hypothesis, CO2 should cause temperature to rise which would produce more water vapor (a strong greenhouse gas), and lead to an enhanced or runaway greenhouse effect which would cause even more carbon dioxide to exsolve from the ocean. But something seems to curtail each rise in carbon dioxide. The cited paper suggests that both temperature and atmospheric CO2 content is controlled by sun-driven decadal ocean cycle oscillations. If there is some influence from human carbon dioxide emissions, it is too small to be detected in the study. Figure 1: Annual temperature change of global ocean temperatures, global surface temperature and atmospheric CO2 December 1981 - December 2011. (Blue is the sea surface, red is the global surface temperature, green is CO2 level in the atmosphere). 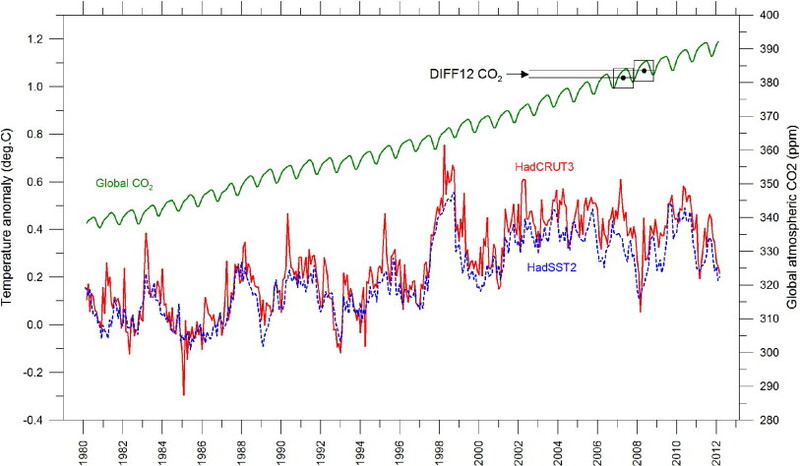 We see that the change in ocean temperatures (blue) occur systematically before changes in CO2 (green). An important new paper published today in Global and Planetary Change finds that changes in CO2 follow rather than lead global air surface temperature and that "CO2 released from use of fossil fuels have little influence on the observed changes in the amount of atmospheric CO2" The paper finds the "overall global temperature change sequence of events appears to be from 1) the ocean surface to 2) the land surface to 3) the lower troposphere," in other words, the opposite of claims by global warming alarmists that CO2 in the atmosphere drives land and ocean temperatures. Instead, just as in the ice cores, CO2 levels are found to be a lagging effect of ocean warming, not significantly related to man-made emissions, and not the driver of warming. Prior research has shown infrared radiation from greenhouse gases is incapable of warming the oceans, only shortwave radiation from the Sun is capable of penetrating and heating the oceans and thereby driving global surface temperatures. A new study from the University of Cambridge Department of Earth Sciences has successfully reconstructed temperature from the deep sea to reveal how global ice volume has varied over the glacial-interglacial cycles of the past 1.5 million years. The study, “Evolution of ocean temperature and ice volume through the Mid-Pleistocene Climate Transition,” reported in the journal Science, announces a major breakthrough in understanding Earth’s climate machine by reconstructing highly accurate records of changes in ice volume and deep-ocean temperatures. It also offers new insights into a decade’s long debate about how the shifts in Earth’s orbit relative to the Sun have taken the planet in and out of an ice-age climate. Reconstructing ancient climate changes is a critical part of understanding current climate behavior and predicting how the planet might respond to future man-made changes, such as the injection of large quantities of carbon dioxide into the atmosphere. Creating such an accurate picture in the past has been problematic. Previous efforts have been thwarted by the fact that the most readily available marine geological record of ice-ages, changed in the ratio of oxygen isotopes (Oxygen 18 to Oxygen 16) preserved in tiny calcareous deep sea fossils called foraminifera, is compromised. It’s seems a fair enough observation: if tree growth is currently being limited by atmospheric CO2 then more of it will increase tree growth. And the implication is that what is currently savanna will become forest: we might assume that what is currently grasslands will become savanna as well.